Oscar Fletcher (left), with Matthew Breen, who holds the Oscar J. Fletcher Distinguished Professorship in Comparative Oncology Genetics. Oscar Fletcher can say a lot about his legacy and then say much more. Between 1992 and 2004, when Fletcher served as the NC State College of Veterinary Medicine’s second dean, the college matured into one of the top veterinary schools in the country. 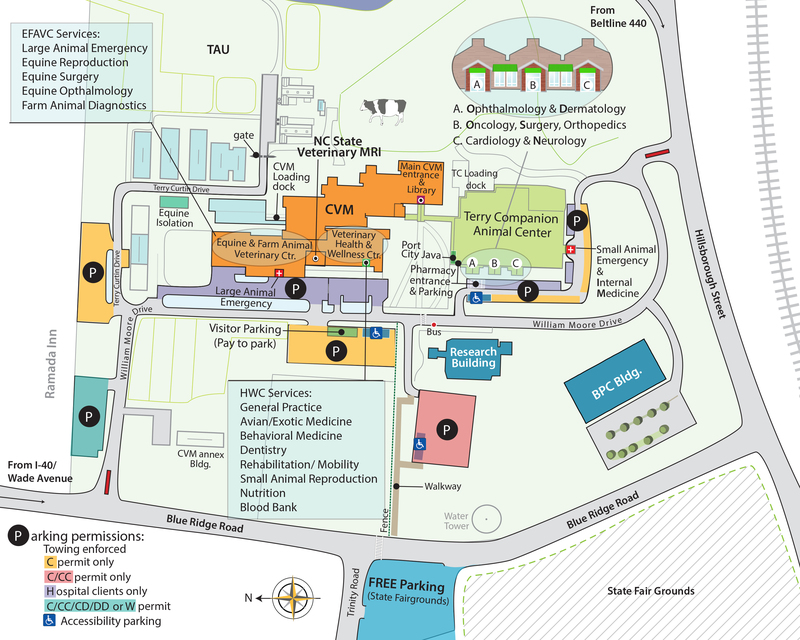 It was during this time that the CVM became a part of NC State’s Centennial Campus and that a landmark gift from Randall B. Terry transformed the campus, creating the modern, enviable Randall B. Terry, Jr. Companion Animal Veterinary Medical Center that bears his name. But it was also during this time that Fletcher did what he he done for the past 50 years: teach. That, in many ways, has meant the most to him. “If you’re a teacher, you take great pride in what your students have accomplished,” said Fletcher. The answer is vintage Fletcher, a man who has always displayed a seamless combination of admirable leadership and enviable modesty. When Fletcher, professor of poultry health management and dean emeritus, retires from the CVM at the end of June, he will leave having forged profound mentorships and friendships with faculty and students. 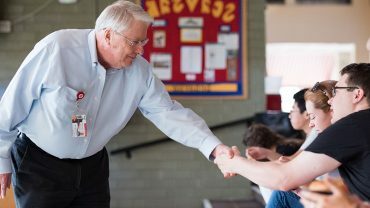 He excelled at administrative duties and in veterinary research, but he was also a reliably friendly face at student orientation, shaking hands with class after class and offering calm words of support. When he went back to the classroom after stepping down as dean, his hand guided the next generation of poultry veterinarians trained the CVM. His kind face wasn’t just expected on campus, it was needed. His vast scientific knowledge wasn’t just well known, it was sought after. A career in veterinary medicine came naturally yet unexpectedly for Fletcher. He grew up on a dairy farm in McColl, S.C., about 100 miles from Raleigh. The farm was built by his father and grandfather, and it was assumed one day Fletcher would run the place. Fletcher assumed he would, too. He had planned on it. But after graduating from Wofford College with a degree in chemistry — and urged by others to pursue a teacher career — he aimed for a future in veterinary medicine. Since he grew up around farm animals and seeing veterinarians visiting the family’s farm, it felt like the right choice. After taking required pre-veterinary courses at Clemson University, he went to the University of Georgia for his DVM and a master’s in veterinary pathology, at a time when there were about half the number of veterinary schools there are today. While there, his faculty sponsor told Fletcher he had arranged for him to study with a professor in Wisconsin who was focused on bovine leukemia. There, he fell into a project that would shape his career. Another student there had completed a master’s project working on lymphoid tumors in chicken and Fletcher inherited the project. The son of a dairy farmer was now working on avian medicine. “Dr. 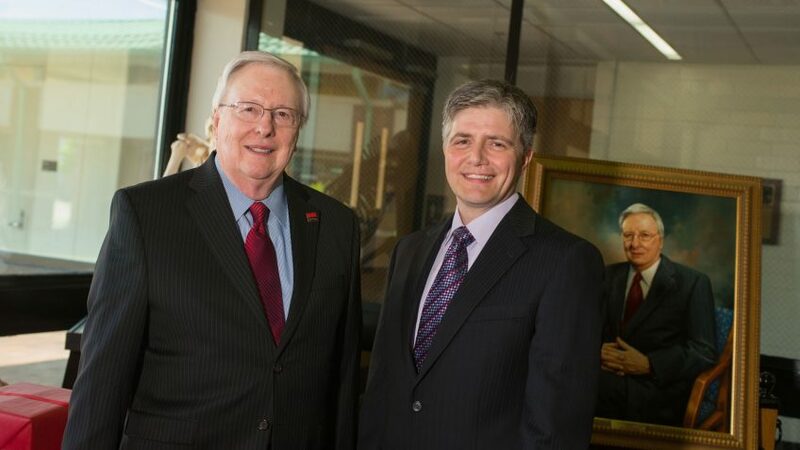 Fletcher’s vision, strategic thinking and commitment to innovation were critical in moving the college to a level of preeminence nationally,” ~ Warwick Arden, NC State executive vice chancellor and provost. It’s a field he stuck with, even after returning to the University of Georgia as an assistant professor of veterinary pathology after earning his doctorate in 1968. A few years later, he moved from the department of pathology to the department of avian medicine at the university, to become the pathologist for the Poultry Diagnostic and Research Center. “I went to Wisconsin for one reason and came out with another one,” he said. Fletcher stayed at Georgia for 21 years, becoming a full professor, then associate dean for academic affairs, and eventually head of the avian medicine department. In 1989, he became dean of Iowa State University’s College of Veterinary Medicine before coming to NC State. That was a big decision for Fletcher, but he felt excited about the chance to help develop strong veterinary programs. “There were opportunities to do more here,” he says. He did more. Under Fletcher’s watch, the college’s extraordinary reputation solidified, but his influence in the classroom has always been strong. He has been involved in the education of 20 poultry health residents at NC State, providing support for a large number of research projects involving the respiratory and nervous systems and infectious diseases. He is the author or co-author nearly 150 scientific journal articles. In 2015, the Oscar J. Fletcher Distinguished Professorship in Comparative Oncology Genetics, now held by genomics professor Matthew Breen, was created. The following year, the one-time reluctant specialist in poultry health was inducted into the American Association of Avian Pathologists hall of honor, part of its inaugural class. Fletcher’s post-retirement plans sound more like a form of semi-retirement. After a vacation in Hawaii in July, he will resume work on a number of CVM projects he’s involved with, including establishing an online continuing education program for poultry health veterinarians in Latin America. He still serves on the Terry Foundation’s board of directors, and wants to continue provide research support for a slew of poultry health projects and for the poultry industry. There is one thing that will change. “My plan is to try not to get here early in the morning,” Fletcher said.